AASU activists burning effigies of CM Sarbananda Sonowal and state BJP president Ranjit Dass in Jorhat on Monday. 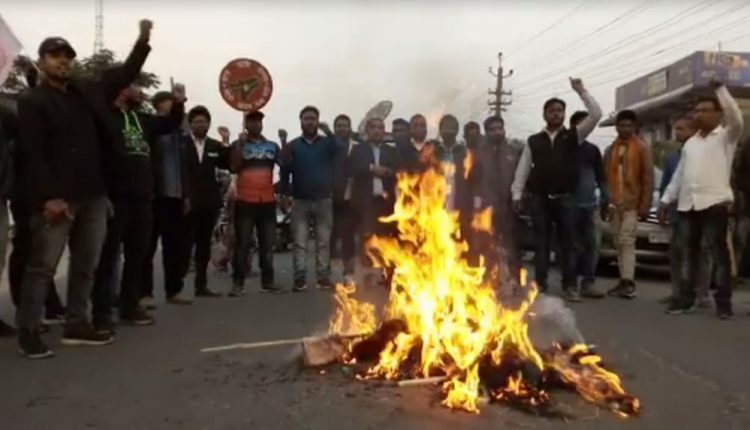 Members of All Assam Students’ Union (AASU) shouted slogans and burnt the effigies of chief minister Sarbananda Sonowal and state BJP president Ranjit Dass in front of the deputy commissioner’s office complex here. AASU members were protesting against the attack on the members of the students’ body on Sunday at Nalbari and stamping of the AASU flag allegedly by BJP supporters. AASU and BJP activists clashed in Ghograpar in Nalbari district in Lower Assam on Sunday when members of the students’ body holding their organisation’s flags along with black flags staged a protest while the chief minister and finance minister Himanta Biswa Sarma were on their way to attend an official function. A few activists of AASU were injured in the incident and a flag of the organisation allegedly was stamped upon during the ruckus which ensued. AASU assistant general secretary Bijoy Shankar Bordoloi said that the protest was organised against Das and Sonowal because the former heads the BJP in Assam and latter was the head of the government. .
Bordoloi said that the students’ body demanded legal action against the persons who had attacked AASU members and warned the saffron party not to repeat such incidents as the students’ body would not tolerate any attempt to intimidate them. AASU state organising committee Jul Khaund also took part in the protest. In another protest Congress members staged a sit-in demonstration in front of the Jorhat district Congress party office here against the Citizenship Amendment Bill 2016. Former Jorhat MLA Rana Goswami and Jorhat district unit Congress party president Dip Gogoi, a former Lok Sabha MP participated in the demonstration which was organised by the Congress legal depart of Jorhat district .